Top of the line stainless steel appliances. Loft with a built-in desk & play area. Crown molding, hardwood, Avonite, Cultured Marble. Birch hardwood floor, weathered Maple cabinets, Avonite kitchen counter tops, Cultured Marble in baths, RV park and garage with a workshop. 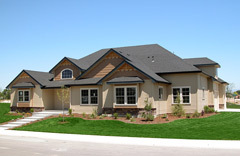 This is a great floor plan for a custom built home. Take a look. Open and airy, this five-bedroom residence reflects the splendor of gracious and elegant living. 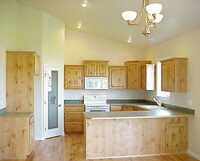 Granite kitchen counter tops, hardwood floor - quality echoed throughout. Stainless appliance in kitchen. Island gas stovetop takes center stage. Wrap around porch with a built-in bench, large patio stab. Charming single level with a large bonus room. Columns in entry marks formal dining area. Hardwood with Cherry wood inlay, skylights in kitchen and bonus, stylish tile accents throughout. Great room living.